Wednesday, October 4, noon – 5 p.m.
Register for both symposia here! 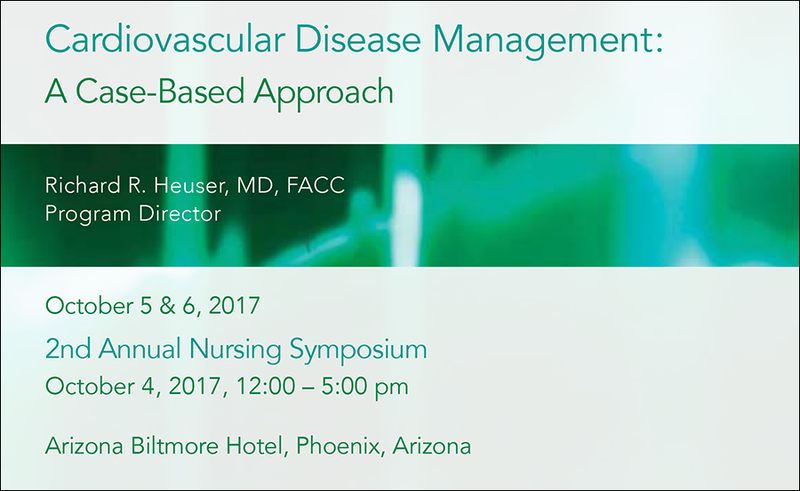 *Complimentary registration is available for IASIS Healthcare employees. Physicians affiliated with IASIS Healthcare receive a reduced registration rate of $495 and can register online here. This continuing education symposium will center on the nuts and bolts of everyday care for patients with cardiovascular diseases, and present new ideas for tailoring the most appropriate treatment plan for each individual. Focus will be placed on gauging and monitoring therapy, including recognizing symptoms, evaluating risk factors, guiding treatment through imaging, general and functional testing, and appropriate therapy. Unlike most programs, this will be delivered as a case based program. In other words, how would I manage a diabetic patient with these lipid levels? Case examples make the lectures more relevant to everyday practitioners. Promedica International is accredited by the Accreditation Council for Continuing Medical Education to provide continuing medical education for physicians. Promedica Internationl designates this live activity for a maximum of 12.5 AMA PRA Category 1 Credit(s)™. Physicians should claim only the credit commensurate with the extent of their participation in the activity. ABIM MOC Accreditation: Successful completion of this CME activity, which includes participation in the evaluation component, enables the participant to earn up to 12.5 MOC points in the American Board of Internal Medicine’s (ABIM) Maintenance of Certification (MOC) program. Participants will earn MOC points equivalent to the amount of CME credits claimed for the activity. It is the CME activity provider’s responsibility to submit participant completion information to ACCME for the purpose of granting ABIM MOC credit.